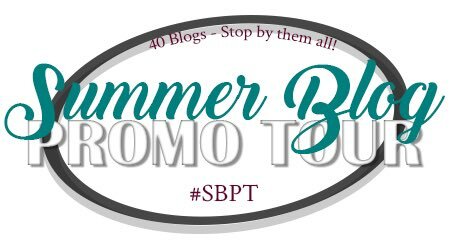 This summer, We Live and Breathe Books (Kiersten in particular) is participating in the Summer Blog Promo Tour hosted by The Book Bratz! That means, every Sunday in July and August, we'll be hosting a different blogger to spread the love. Today, Eli from The Silver Words and Kiersten are going to share some of their favorite dances, which is especially appropriate since National Dance Day was yesterday! iKON is one of my favorite kpop groups, and their performances have amazed me since they were trainees. This dance is from when they were competing in the show WIN: Who is Next as Team B, and I love the way that they perfectly synchronized with the music. They work together as a team brilliantly, and they always look like they’re having fun. Even though their concepts aren’t the most original or awe-inspiring, Poreotics still manages to wow me with their dances. This has been one of my favorite dances for a long time. It’s elegantly simple, and even though it’s pretty short, it captures the talent of both Lawrence and Dumbo. This dance is from So You Think You Can Dance Season 8, and with it, Melanie and Marko were cemented as my two favorites from that season. They’re both incredibly talented, and I loved the stories that they were able to tell through their dances. This one especially meant a lot to me, and I was glad that they were able to perform it. Before I Am Me, I was completely partial to Quest Crew. Quest is flashy and fun, but I Am Me won me over with their heart and their incredible ability to work as a team. The illusions that they create are stunning, and their performances are always powerful. This one is one of the many great ones that they did while competing in America’s Best Dance Crew, and I was so proud of them when they won. I'm not sure if I've talked about it on here before, but I started dancing when I was 6-years-old, started competing at 9, and even after graduating from high school and retiring from competitive dance, I still dance and choreograph for a dance organization at school. I've done many different styles including contemporary, ballet, pointe, modern, hip hop, jazz, tap, musical theater, and I even took a beginner ballroom class at school. Basically, I've always loved to dance and watch dance. I was supposed to pick five dances to round out this top ten, but I'm going to cheat because I DO WHAT I WANT. This dance happened in the first season of So You Think You Can Dance, and I'm still not over it. I'll never be over it. This is just one of those dances for me that I'll forever think is absolutely brilliant. It was so different from anything I'd seen before when I first saw it, and I still love it all these years later. I'm working on a dance project in the fall for my friend's honors capstone project, and he's been sending us some of his research so we can start seeing the style for the piece. This is probably my favorite of the dances he's sent so far. The thing I love about this one is that it's so compelling - even when I don't plan on watching it all the way through, I just can't pull my eyes away until the end. This is one of my favorite hip hop combinations of all time. The great thing about this is how different each group looks doing the same choreography. While I love really precise dances (I'll have one lower that's really tight), there's something so great about looser dancing like this. Also, these people hit this choreography SO HARD. Goals. Ok, so I know this is a ten minute dance, but I promise that it's totally worth it. This one was choreographed by Parris Goebel, who you might recognize from Justin Bieber's Sorry music video (Aka the music video that actually made me like that song. Like, I'm so obsessed with the dance that it makes me like the song more. I learned a lot of the choreography from the video, so now I ALWAYS want the song to come on so I can wow all my friends by doing the dance). Anyway, this dance has so many different flavors of hip hop in it, and they're all executed so well. I can't imagine how it must have felt to be in the audience for this. Since I mentioned watching dance in the audience, I just wanted to add a little bit of my two cents in on that because it is partially related to my next dance pick. I personally feel like there's something that's so much more magical about watching a dance live. When the recital at my dance school was coming up, all the dance classes that happened at the same time would usually come together and show their dances as practice for the performance. There was this one dance from another class that I really loved watching - the choreography was so great, and there was this feeling in the room when they did the dance. Of course, I've since then watched the dance on the recital DVD, but it's not the same. There was something about seeing that dance in person, in the rehearsal space, that added to it - something about watching it up close. From a distance, some of the magic was lost. I could go on forever about this dance. This is honestly one of my favorite dances of all time. I think about it almost everyday (I'm not kidding). This is choreography goals to me. Contemporary has always been my favorite style, and I absolutely love this kind of choreography. The dancers are so committed and precise - they dance with such beautiful abandon. The video above is the one posted on the choreographer's YouTube channel, but I'm also going to link to a video of the dance at a competition because I feel like seeing it straight on like an audience would gives an entirely different perspective to the choreography. I'll never get sick of watching this. If I could go back in time and redo anything in my life, it would be making sure that I was in this dance. So this was originally supposed to be the end of my picks (aka sticking to just five) but then THIS DANCE HAPPENED ON MONDAY NIGHT ON SO YOU THINK YOU CAN DANCE, AND I WOULD BE DOING A DISSERVICE TO YOU ALL IF I DIDN'T INCLUDE IT OK. I'm sorry for yelling. I will admit that this one is a bit strange, but it's absolutely beautiful nonetheless. Travis Wall is always brilliant. This is definitely my most artistic pick on this list. Like I mentioned above, in the past two years of college I started choreographing for the dance organization that I'm in. I've decided that I'm going to share with you guys some dress rehearsal videos of the dances I choreographed! You can look for me in the videos - I'm the one with the dark hair with blonde underneath, if you can see it. This is the first thing I ever choreographed! It started out as a combination for a workshop, and then I decided to do a full dance with it. After choreographing Atlas my sophomore year, I choreographed two other workshop pieces before I did this one last year. This one was especially fun to work on because I decided to play with a lot of different things happening at the same time. Rehearsals were often confusing, but I think it ended up being pretty cool! I'm going into my senior year, and I'm hoping to choreograph again this year! I also have this idea for a duet that I want to potentially collaborate on to make a properly filmed version, so hopefully I can make that happen. If you want to check out some of the workshop combinations I choreographed, you can check out the first one here and the second one here (I sprained my ankle a few days before teaching this workshop, so it was a struggle). Anyway, I hope you all enjoyed this dance post! While it is entirely unrelated to books, I know that Eli and I really enjoyed working on it! Do you like watching dance? 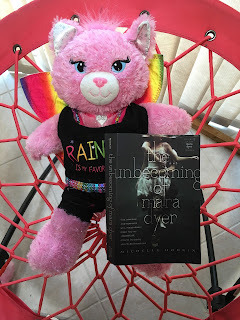 This Saturday, my sister's cat Annie and I are reading The Unbecoming of Mara Dyer by Michelle Hodkin! This is Annie lounging around on her bungee chair on a hot summer day with a good book. She doesn't weigh enough to make it bounce but she likes the feel of it anyway. So far: We just started yesterday and I think Annie might be a little further ahead because of her lazy lounging tendencies but I myself have only just finished chapter seven as I had a few other things to do. However, the beginning is pretty interesting and I really like her portrayal of Mara's PTSD (or is it ~something else~ ?????? 🤔 🤔) and can't wait to read more! Sneak peek: Annie loves ouija boards so I'll share a scene from one of the first few pages where Mara Dyer and her two friends use one just for one, with her best friend asking "How am I going to die?" The three of us watched the board. My calves pricked from kneeling on Rachel's carpet for so long, and the backs of my knees felt clammy. Nothing happened. "Murder? Claire's voice was soaked with excitement. She was so sketchy. What did Rachel see in her? "Mauling?" Claire asked. "Maybe you set a forest fire and get eaten by Smokey the Bear?" Rachel laughed, briefly dissolving the panic that had slithered into my stomach. When we first sat down to play, I had to resist the urge to roll my eyes at Claire's melodramatics. Now, not so much. We were silent. Our eyes didn't leave the board as the piece jerked back to the beginning. I can't speak for Annie but personally, I love spooky books so I hope this one has some creepy twists! Hi, everyone! Normally I would wait to show off my TBR for next month, but I've decided to participate in a few reading challenges in August, so this is my declaration post! In August, I'll be participating in ARC August hosted by Read.Sleep.Repeat. 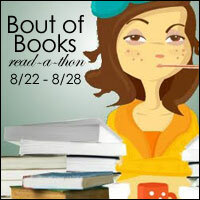 and #ReadThemAllThon (August 14 - September 4) hosted by Read at Midnight! I've yet to read a Taherah Mafi book (I'm the worst), but this one sounds so good. Plus look at that gorgeous cover! This book is about a girl going through recovery from self harm, so I think it's fair to say that it might make me cry. I read a few pages when I first got it, and I'm really excited to read it. We don't need to talk about how I haven't read this book yet. Nope. But that's why I want to read it. So I can stop being upset with myself for not having read it. It's all good. I am so so SO excited to read this! I've heard only amazing things about this and it sounds so good. I can't tell from the description if this romance is going to end well, but it seems like it's definitely going to be epic. This book is a Russian fairytale retelling set in Brooklyn, with a magic doll and a witch. It sounds absolutely magical and wonderful. This isn't exactly a post-apocalyptic setting, but it is a dystopian set in a future New York City. 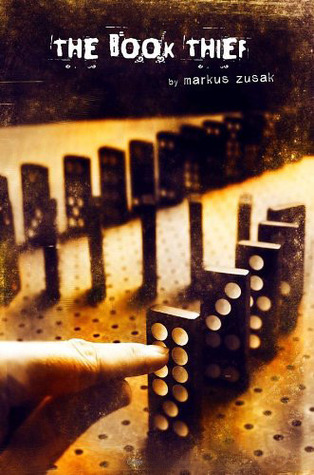 I haven't read a dystopian in a while, and I'm really intrigued by this one. The cover is mostly red, so it totally counts. There are witches in this, so I'm down for it. 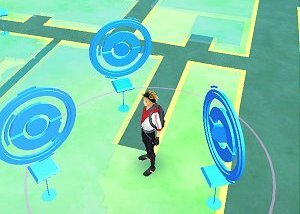 On top of earning the gym badges, there's also a challenge to get the highest CP Pokémon! If you want to read more about how that works, you can check out her sign up post here. I've decided to pick Squirtle as my Pokémon because you can't go wrong with a classic. 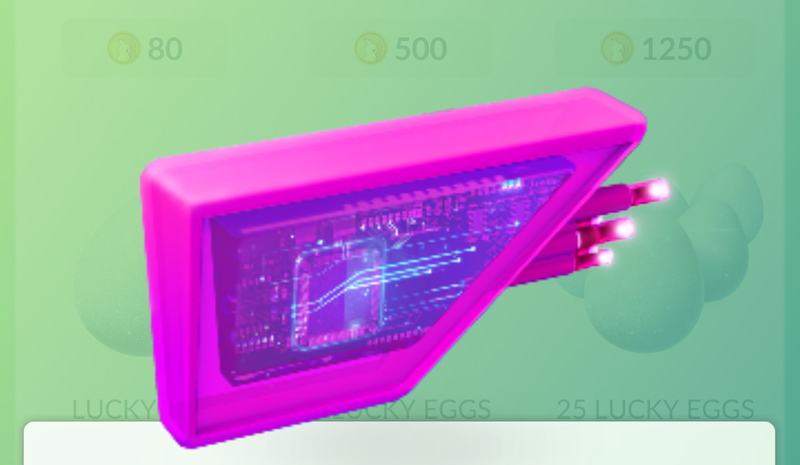 If I complete all the badge challenges, my final CP would be 557, including starting CP, badge completion, and evolution bonus points! Of course, I might end up changing some of the books I picked, so who knows what CP I'll end up with. Since #ReadThemAllThon starts on August 14th rather than the 1st when ARC August starts, here are some other ARCs I'm considering reading this month. I'll likely only read two or three of these, but I'm keeping my options open! It just so happens that Bout of Books will be happening during these challenges as well, so I'll probably try to join in on that too! August is going to be CRAZY! Are you participating in ARC August or #ReadThemAllThon? Link me to your TBR in the comments! I wanted so much to like this book. 99 Days is about a girl named Molly Barlow, who sounds like she should've been an American Girl Doll. Molly Barlow, as much as I tried to like her and see past any mistakes its clear that she's made, was literally impossible to like as a character. Genuinely. I'm not usually one to dislike unsympathetic protagonists because I think they're interesting to read about, but I just wanted to grab Molly by the shoulders and shake her repeatedly until she could figure her life out. Seriously, this girl just truly took a lot out of me. You might be able to tell from the cover of this book that this is a ~romance~. Insert main love interests here: Gabe, older brother to other main love interest, Patrick. Patrick is the twin of Julia, who was Molly's best friend growing up. Then there's Patrick's girlfriend who plays the minimal role of someone who tries to befriend her boyfriend's cheating ex-girlfriend only to find out that surprise, she's a horrible person. Sorry, still a little salty about Molly. Anyway, as I just mentioned, Molly cheated on her first boyfriend and love of her teenage life Patrick with his older brother Gabe. Everyone finds out that she slept with Gabe and she basically runs away to another high school until the summer before college, when she has to live in her hometown. She's welcomed back with trash talk, surprise again. So she gets a job and starts her relationship with Gabe (that couldn't be a problem right?) I just don't understand why Molly was so thirsty as to get involved with this guy again knowing it would cause her problems. But whatever, let's go along witht this because plot. Anyway, I really hate Molly because she never feels bad about hurting Patrick, she just wants to get back in good with his family and dates Gabe to do that (that's what I feel, anyway). I thought this book would be a lot like The Summer I Turned Pretty by Jenny Han, which is a fantastic series that also revolves around two brothers and a girl. However, it had some deep parts and I didn't wind up hating any of the characters, because there was balance to how truly immoral and annoying they were. I'm mentioning this now because I want to make it clear: tabboo books of any sort, cheating, scandal, what have you, I like them all when they are written in ways that acknowledge the wrongdoing and attempt to salavge the remains of what is left. I didn't like this because there was no real character development. Molly was the exact same character at the beginning as she was at the end, and so was literally every character. No one changed or grew at all, more people just made more bad choices so that Molly could somehow feel absolved of hers. Maybe you'll love this book, I don't know. It was certainly enagaging but to me, in a character driven story like this one (with mostly conversations and not a whole lot of plot) there needs to be character development. Something to hold on to. This book didn't have that, but it was certainly good at drawing me in and keeping me enticed until the end of the book. I'd like to read more from this author, and see if the brother-brother plot just didn't work for her. I think her writing could totally shine in another piece! What are some love triangle romances you've read & enjoyed? Things Books Have Made Me Want To Do or Learn About After Reading Them! Magic. Probably the most obvious one, but who among us hasn't read Harry Potter and wished upon every star that they'd wake up a witch or wizard? I'm still trying to get to that plane of existence and party with my Hogwarts homies, one way or another. Archery. The two most prominent books that come to mind are The Hunger Games and Lord of the Rings but I feel like a lot of books, especially fantasy ones, have skilled archer protagonists. It sounds like a really cool and badass thing to know, but full disclosure, my friends have a bow and sets of arrows and I tried using them and it was a little bit of a mess, so we'll see if I become the next Green Arrow. Time Periods. So I'm just gonna talk about this in general as opposed to my experience after any specific books but whenever I read books that are clearly set in or focus on another time period (a solid time period, not like fantasy books with an arbitrary feel of ~long ago~) I get really into knowing more about it. 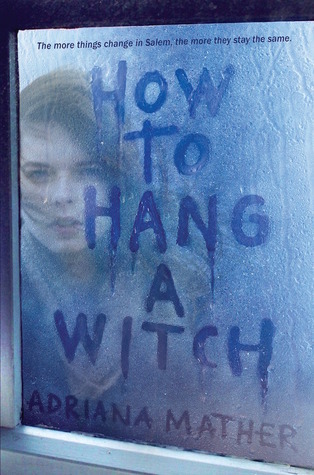 I just reviewed How to Hang a Witch, which takes place in the present day but heavily centers on The Salem Witch Trials and it's made me want to delve into them even more. Piracy. Being a pirate sounds cool and even though I haven't read too many books with pirates (a real shame, honestly) whenever I encounter one I become obsessed with the idea of living my life at sea in pirate clothes with my pirate friends. Better learn to swim first, just in case. Time Travel. Ever since I read the Molly Moon series about a girl who time travels back as a little kid, I've been obsessed with the idea of time travel. So exciting! Hand to hand combat. This is my Hunger Games dream -- hand to hand, hand to weapon, hand to ferocious evil animal, all of it is my game. Lowkey I know that I am one day going to have to fight someone to the death and when that day comes I'm going to put into play all of my hypothetical fictional knowledge. Werewolves. From Twilight (I know, I'm sad about it too) to my homeboy Remus Lupin I've been seriously into werewolves since like the 7th grade. When I was a kid my mom always pointed the full moon out to me so now whenever I see it I think of her and also how awesome it would be to be a werewolf. Like sure I'd be discriminated against but it still seems kind of rad. Alternative Religious Histories. I was a Dan Brown nut for like, several years of my life. The Da Vinci Code and Angels and Demons was my life for a super long time, I even spent the time looking up all the paintings and places referenced in the book so I could understand it better. I like lowkey love conspiracy theories so this was the beginning of that. Horses. I am sad to admit that I was once one of those fourth graders that truly loved horses. Ever since I read the American Girl Doll Felicity series, I fell in love with her horse Copper and then just horses in general. I have thankfully moved past that stage in my life, but I did love horses for a lil bit. What have books made you want to learn? Thanks to Knopf Books for Young Readers for the ARC I received at BEA! You know those books where after only a few pages you just know you're going to love it? That's how I felt when I started reading How to Hang a Witch. How to Hang a Witch follows Sam Mather as she moves from New York City to Salem. While Sam is less than thrilled to move to Salem, she did not anticipate how terrible moving there would actually be. Sam Mather happens to be a descendant of Cotton Mather, one of the people most responsible for the Salem Witch Trials. Unfortunately for Sam, descendants of the accused who live in town are really out to get her, especially when Bad Things keep happening. Now Sam, a girl who believes in neither magic nor ghosts, has to deal with both. From the beginning, I really loved Sam's voice in the book - there's something really blunt and down to earth about it. All the narration felt so natural, and it was easy to settle into the flow of it. On top of that, Sam is an extraordinarily ordinary character - there's nothing particularly special about her; she's all-around average - which made her stand out to me as a protagonist. Sam is confident, insecure, distrusting, awkward, witty (in a way that actually reads natural rather than calculated), protective, angry, and so much more. Adriana Mather did such a brilliant job building such a real character, which I think is the main reason I loved this book so much. Besides Sam, there are many other complex supporting characters, including Jaxon, Elijah, and Susannah. I'll cut it short talking about these characters because I've already gushed over the character development for Sam, but seriously, Adriana Mather's characters are so well developed. The supporting characters, just like Sam, feel so real and layered. When it comes to the plot of How to Hang a Witch, it is most prominently a mystery (and a good one). I just wanted to keep reading it because I wanted to know what the big mystery was. The pacing of the mystery was done so well, building up the suspense slowly at first until BAM everything was happening and I couldn't tear my eyes away from the pages. I was so surprised by where the plot went - it was so exciting! While the mystery is the biggest part of the story, How to Hang a Witch is also a story that explores bullying. I'm of the opinion that everyone has been bullied on some level, even if you don't recognize it as such. The great thing about How to Hang a Witch's bullying dialogue is how it is paralleled to the Witch Trials. Mob culture is so prominent, and Adriana Mather did a fantastic job exploring this without making it a book about bullying. There are also some fun romantic elements, which were sweet, but I wouldn't say this book is really a romance. The guys were super swoony though. How to Hang a Witch is definitely one of the best books I've read this year, and it has definitely claimed a spot in my favorites. I absolutely fell in love with Sam and her voice, and I'm curious to see where this series will go. I highly recommend this incredible debut! Honestly, who didn't find the Salem Witch Trials intriguing in school? Mass hysteria, witchcraft, an air of mystery -- yes it was tragic but like a car wreck you can't help slow down to stare at. When I read the description of the book, I knew it was a concept I could get behind and Adriana Mather did not disappoint. How to Hang a Witch focuses on Sam Mather, a descendant of Cotton Mather -- one of the biggest players in the Salem Witch Trials -- through her move to Salem from New York City. Sam is ostracized and scrutinized for her ancestry, particularly by a group of five students known as the Descendants, whose ancestors were hanged in the Trials. Her rocky start extends further than being a loner at school though and she ends up involved in a centuries-deep mystery, with the ghost living in her house helping her along the way. The mystery in this book kept me captivated the whole way through. How to Hang a Witch is pretty fast-paced and there isn't much idling around, mulling over information. It's all either action or searching for -- and discovering -- new information that propels the plot forward. Honestly, when I realized that ghosts in this book weren't floaty see-through wisps of people and were able to be touched (by those who could see them) I questioned everyone and just threw out mental accusations that everyone was a ghost. Her one friend in school? Ghost. The one Descendant that talks to her? Ghost. Nevermind that other people were clearly interacting with them as well, I had to be on guard for any twist. When we found out about magic and spells and witches, I accused each character of that too. No one was safe from my scrutiny. With that in mind, I technically had been prepared for the ending because I overthought it so much, but if we're ignoring technicalities it was unexpected and didn't feel gimmicky at all and overall was very well done. It's often hard to work a good mystery element into a book and balance it with the paranormal element but Adriana Mather exceeded expectations. The book was told in first person by Sam and while it took me a few pages to warm up to her and her style of narrating, I really liked both the writing of the book and the character herself. I enjoyed her sarcastic quips and, like Kiersten said, they didn't feel forced or unnatural. I felt so much sympathy for the way her life had gone -- her dad in a coma, no friends to speak of, trust issues. She was such a real character. I also really liked Elijah, the ghost, and how he went from annoyed and untrusting to forming a close bond with Sam. Another favorite was Susannah, a Descendant, who I kinda wanted to be a little. She was so elegant and poised that I could feel it seep through the pages, but she wasn't cruel like Lizzie or cold-hearted like Alice. She had a kindness in her that she slowly let through and I found her character super intriguing. We had a bit of a love angle with Sam and her neighbor (and classmate), Jaxon, but it wasn't an overwhelming part of the story. I think the main focus was always the mystery with a little bit of romance on the side. I'm thankful there was no Big Love Triangle with two guys fighting and her picking sides and friendships being ruined. Speaking of Jaxon, he's adorable and sweet, but his mom is even more so. She's the mom you always wanted, constantly baking, never upset, helping out in your witchcraft needs, a perfect lady really. Because the book was fast-paced and moved on from scenes quickly there were a few places I felt I would have liked more detail, like an explanation of some of the magic -- such as immortality magic or face-changing magic. Other than that, though, I found the book wonderful. One of the coolest things about How to Hang a Witch was how even though it wasn't historical fiction, it brought the history to the modern day without making it a classroom history lesson. Yes, the witch trials happened three hundred years ago, but could mass hysteria lead to someone getting hanged without trial again, in a different form? Like bullying? Adriana Mather fantastically weaved this narrative into her story and it's an amazing takeaway from the book. Adriana Mather explains in an Author's Note that she herself is a descendant of Cotton Mather and that history is important in her family, that this book came about after exploring Salem. That was really cool for me too, that not only was her own family history so rich, but that she could take it and turn it into something so intriguing. On a lighthearted end note, Sam makes a comment that the pizza in Salem isn't as good as her native NYC and I couldn't agree more. I moved to NC a year ago and I have yet to find pizza up to par with the pizza back in NJ/NY. One day. Have you read any books about the Salem Witch Trials? Today, Tina from Tina The Bookworm is here with us! Hi Everyone! I’m Tina from Tina The Bookworm and I’d like to thank Kiersten for having me on her blog today. We both tried to brainstorm ideas for a collaborative posts and Kiersten came up with a bookish scavenger hunt. She would give me 10 prompts and I would give her 10 prompts. We saw that we were both supposed to spotlight each other today so you can see the prompts she gave me here and the prompts I gave her on my blog today. Feel free to join in on the scavenger hunt, and check out what Kiersten found here! The Book Thief has a total of 550 pages. I recently just started reading this one and it’s pretty good so far. Hannah Fielding always has the most beautiful covers and they mostly have faces on the cover. Emery Lord has the prettiest covers ever. When We Collided was no expectation. I haven’t read this yet but it’s so pretty to look at. I actually didn’t think I had any books that started with a C but I saw Catching Fire sitting on my shelf. The spine on The Inside of Out by Jenn Marie Throne is just gorgeous. I’ve only read The Raven Boys so far and I’ve loved it. I plan on finishing The Raven Cycle very soon. This is one of my most anticipated releases of 2016 but I haven’t read it. Aristotle and Dante are the sweetest. If you haven’t read this yet, you should. I’ve only read Cinder so far and I have to say that I am loving Queen Levana. I’m curious to see how this series goes. This was the hardest prompt. It took me a while to find a book that fit the prompt. I won this one in a giveaway. Thank you so much Kiersten for the wonderful idea of a Bookish Scavenger Hunt. I loved searching for them. I am a twenty something stay at home mommy of three. Proud Ravenclaw and Bullet Journalist. New Adult, Indie and Romance Junkie. I'm a recovering sodaholic, and by recovering I mean I'm not even trying. I blog about books, movies, TV shows, and my bullet journal. What books did you find on your shelves? Like every other reader of YA, David Levithan has been an author I've long admired and whose work never fails to leave me reeling. I'd never read anything by Nina LaCour, however, but after this book I'll definitely be keeping tabs on her future work. The book takes place during San Francisco Pride Week, and alternates point of view between Kate -- a senior in high school madly in love with a girl, Violet, she knows only in glimpses (pictures, descriptions, letters) -- and Mark -- a junior on the baseball team madly in love with his best friend (sometimes with benefits), Ryan, who seems to have no idea. Mark and Kate both sit next to each other in Calc but have never noticed each other until the night the book kicks off. You Know Me Well is a really short (248 pages), light book. It doesn't have any shocking plot twists or unexpected murders or anything like that. It is what it is: a book about friendship, romance, and personal reflection. So, if you aren't into cute contemporaries, this is probably not the book for you. I, personally, thought it was a fun read with a good story. The book jumps into the action and therefore doesn't take too long to set up who the characters are before things start to happen but they never felt undeveloped. I love the way their personalities unfold as the book goes on, but even in the beginning they are cohesively introduced. Often when I read a book I picture the characters interacting in my mind, but this time, there was something about the writing style of both point of views that made me picture myself (in the first person) experiencing all their experiences and I really liked that about the book. I was Kate, afraid of committing to something real, exploring the possibilities. I was Mark, feeling so deeply, so purely. I didn't share their specific experiences in reality but the way they were written I could find bit and pieces to relate to. I loved exploring the friendship between Kate and Mark, as well the friendship between their respective best friends. I know some people were complaining about them being insta-friends and it not being believable but honestly I have made so many of my friends by just hitting it off in one go and just becoming close right off the bat. I don't think insta-friends is a real thing. They had such a sweet progression of their friendship and really seemed to care about each other. Also, I found it really amusing whenever Mark would third wheel even when he didn't want to because it subverts the whole thing where characters get together and then they abandon their friends or only mention them in passing. Their friendships and their relationships were all important. Speaking of friendships, there were some hard truths with both Kate and Mark's best friends and it was sad but honest. You Know Me Well is a pretty fast-paced book. The whole thing happens over a week and there are a decent amount of things that take place over very few pages, but I like when books move quickly. However, this can make it seem kinda...surface-level? (Not sure what word to use there to convey my meaning.) Some of it was definitely a little "this is definitely a contemporary novel and not real life" but it wasn't overly so and it didn't really bother me. I thought the ending was a little cutesy and would have liked to see a little unhappy mixed with the happy ending (not that I like seeing characters sad, just that it would be cool to have reached understandings about relationships with some people) but it was still sweet and I still enjoyed it. Overall, I think both authors did an awesome job. Like I mentioned before, this was my first Nina LaCour book and I am interested enough to keep an eye out for anything new. 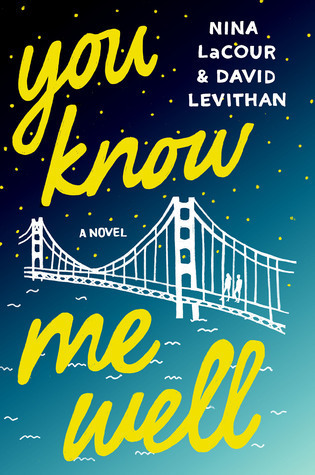 While this didn't become my new favorite David Levithan book or anything, I thought it was a fun read and would definitely recommend it. Hello friends! Like Noor, I have been a fan of David Levithan since the powers that be dropped him in my lap many years ago. I have also never read anything by Nina LaCour but I'd be open to reading more from her. This book was a /super/ fast read, it took me all of a couple hours to finish it -- this is mostly where the book gets points off, I think a lot of stuff happened for just one week of action, personally there should've been a lot more hashing out of the plot for the amount that went down in this book. I love fast paced reads but too much happened for the physical amount of book there was. So as Noor said, the book goes down during pride week where two people (Kate and Mark) fall into an instant friendship. I honestly really think instant friendships are a thing, I experience them all the time -- also, in regards to insta-love, I never have a problem with people feeling an immediate romantic connection, just when they commit their hearts and souls to each other after a weekend on a beach or something. I really loved this book too because as Noor mentioned, both the main characters are LGBTQ+, and in even the most ~diverse~ books, there is at most, one LGBT relationship mentioned. I also really liked that they weren't questioning their sexualities, just struggling with love in general -- most of the books I've read before with LGBT characters face some sort of identity crisis. The plot of the book was nice and simple, and discussed the woes of loving friends and strangers alike, genuine friendship, and figuring yourself out. I liked how everything played out a lot, and while the character development felt a /tad/ choppy for my taste, I really resonated with the characters. Kate and Mark were written so well, with two completely distinct voices. I loved so much how their parts flowed in with one another. Even the supporting characters, Lehna, Ryan, Quinn, and Violet all had such complex backstories and emotions that it felt like I was reading about real life, rather than two real main charcacters and a bunch of static side characters. The thing I liked the most though, was the way the book ended. I'm all for happy endings but I like when happy endings are happy in a way that I wouldn't have thought possible. I have a lot of love for this book, I just wish it was a little less choppy. 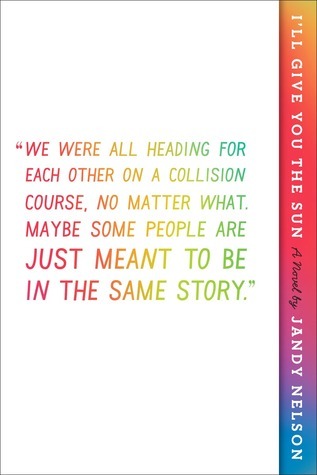 Always in love with David Levithan and looking forward to more of Nina LaCour's books! The cover I posted here is the one on the physical book I read, and I really loved it. The quote honestly represents so much of what the book is about and I like it a lot. This book is about Jude and Noah, who are twins. Noah's chapters are written age 13-14, and Jude's are written at age 16. They alternate, but still somehow manage to tell a cohesive story. The PoVs talk about two really important times in both of their lives, with the Jude passages showing reflection on the past and the Noah passages foreshadowing the future. The plot details NoahandJude (how they often refer to themselves in the book) breaking into Noah and Jude. A lot of family angst with their parents and between themselves occurs and attempts to be resolved. The best thing about this book is probably the incredibly unique way it was written: I've seen books with alternating PoVs before but never detailing different periods in life. If the book wasn't written this way genuinely it would've been a 3 star book at best. It was just such a cool way to tell the story and if for nothing else, I'd suggest reading the book to experience that. The book was really metaphorical, with lots of italicized /meaningful/ quotes from the twins' mother and grandmother all through out the book. When I was first beginning to read the story I thought it was psuedo deep and distracted from the plot, but then I realized the metaphorical nature of it all was the plot. So the story focuses on the twins, who are both artists. When they're 13-14, Noah is weird and Jude is normal by all standards, their parents are fighting, Noah is an artist and they are NoahandJude. At age 16, they are Noah and Jude, with Noah being normal, Jude being the weird one, their dad bonding with Noah and their mother's ghost hanging around, and Jude is the artist. The book unravels what it is exactly that went wrong in their childhood that everything ended up so twisted, and points to choices that each character made that would you wouldn't necessarily expect. The characters are written so well, each with a specific backstory and flaws and love that they don't outwardly show. Every single character, in my opinion, is written in a way that builds the plot and adds to the value of the story. The only reason I didn't give this book a 5/5 is because the middle parts of the book were a little dry -- it took me more than one session of reading to finish it and usually I'm not a fan of taking breaks right in the middle of stories. This book was so unique though, both with how the characters were built and the actual set up of the narrative -- highly recommend. Who is meant to be in your story? 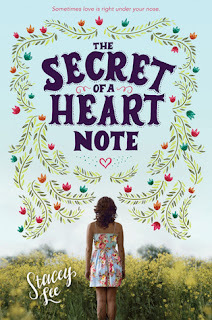 This week I'm waiting on The Secret of a Heart Note by Stacey Lee! I just recently found out about this book, and it sounds really cool! The aromateurs concept really intrigues me, but it also sounds like it's going to be a really sweet romance. Plus look at that cover! Can't wait for this one to hit shelves in December! 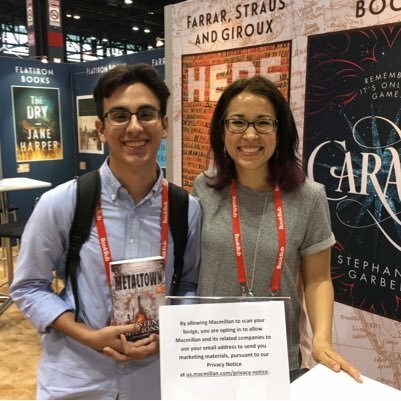 Books set outside of the US! The Lunar Chronicles in general is a great series that does not take place in the United States. While the places aren't always referred to the same as in present day, the characters travel through many different countries (and the moon) throughout the series. Cinder takes place in a futuristic version of China. I decided to forego picking a book from The Infernal Devices trilogy for a book of similar location and feeling. The Sweetest Dark takes place in World War I England, but it's not quite a war story. There is romance, fantastical elements, and so much snark. I can't say enough how much I recommend this. 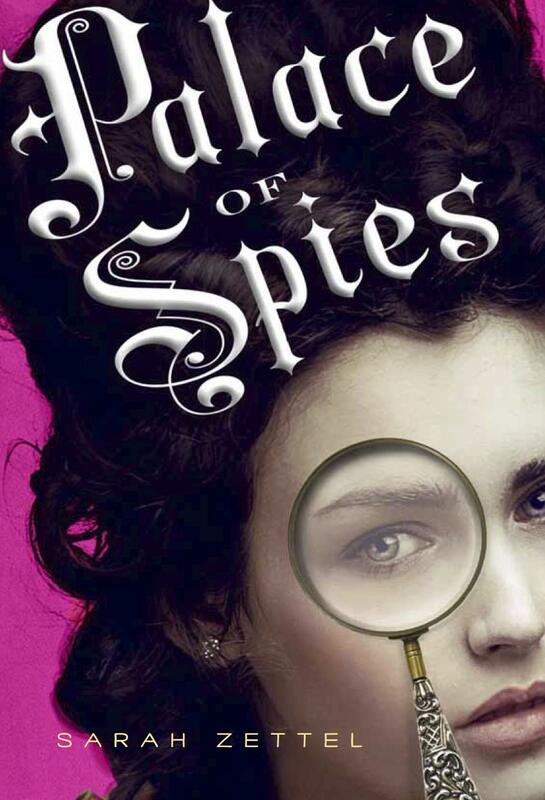 I read Palace of Spies a long time ago, but I came across it when looking for books for this topic and knew I had to include it. Palace of Spies is a story of espionage (in case spies in the title wasn't obvious enough) that takes place in the court of King George I. While that is a main element of the plot, there's also romance, mystery, and a ton of humor. 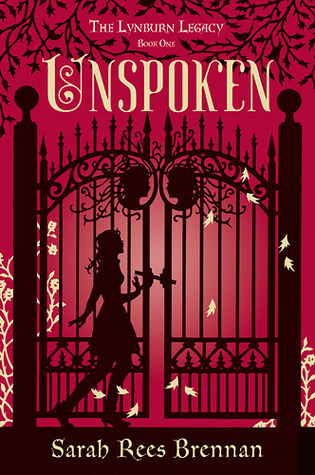 Unspoken is another book that takes place in England; this one, compared to my other picks, is set in the present. I loved this mysterious and magical book (even though Sarah Rees Brennan has a way of destroying your heart). Third Daughter technically doesn't take place in a real location, but it has the distinct feeling of an alternate reality India. 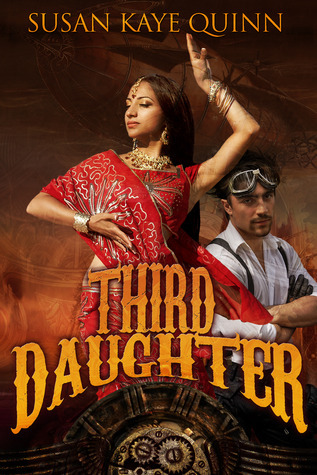 The fun thing about this book is that it crosses Bollywood with steampunk. Considering steampunk usually has a Victorian England vibe, this one is really different while still cohesive. You might be able to guess that this book takes place in France. This is an adorable, light hearted romance about a girl who travels from Atlanta to Paris. Ya'll know I love my light hearted romances so I just had to throw one in here. This book came out like, 11 years ago, but still, such a good book. Our main character Ginny is left with 13 blue envelopes and a thousand dollars and told to travel to London and follow the specific instructions in the envelopes. The book feels so original and so so good. 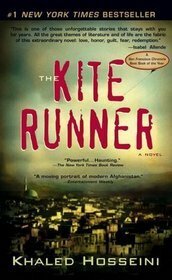 The Kite Runner, aka one of my favorite books of all time, takes place in Afghanistan. The book is so much about friendship and power, and is written in a way that actually incorporates Afghanistan's history into the story. Cannot more highly recommend this. A boy travels from Spain to Egypt. This book came out in the early 1990s but it's phenomenal and books that are kind of old tend to fade away with less recognition. 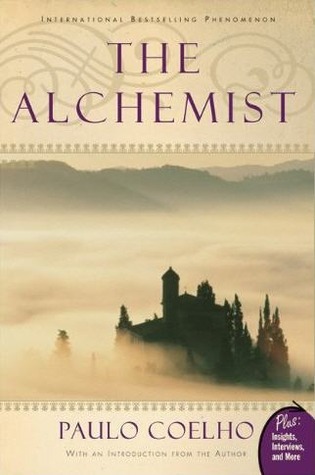 This book has a quest for treasure, kings and alchemists and gypsies galore. If you haven't read this yet, what exactly are you doing? This book takes place in Germany during World War II, and details the story of a young girl stealing books. It's filled with danger and an overwhelming love of books, and I'm sure anyone who follows a book blog would enjoy the premise of it. What are your favorite books set outside of the US? Thanks to Simon Pulse for the eARC I received via NetGalley! When Harper gets the chance of a lifetime to intern at Shift magazine in New York City for the summer, she couldn't be more excited; however, there's a catch: she's going to be the dating expert. This wouldn't be a problem if Harper actually knew something about dating, but she doesn't - that was always more of her best friend Christina's expertise. But now, Harper is off to the city to fake her way through this internship. Harper is a shy girl who has never really stood out, but now, thrown completely out of her comfort zone, Harper has to try to find the confidence to show how extraordinary she really is. Fortunately for Harper, being in a new city surrounded by new people allows her to reinvent herself with the help of "Aunt" Vee, her mother's college roommate with whom she's staying for the summer. Aunt Vee helps Harper learn what's what when it comes to fashion so she can survive at Shift. Aunt Vee also has an overweight pug named Princess, who is the main reason Harper connects with her first friend in New York. Ben is the boy who walks Princess in an attempt to get her into shape for the pug prom at the end of the summer. Harper and Ben almost immediately hit it off and his friendship is invaluable in helping her figure out what she's doing while Christina's busy working back home. At Shift, Harper doesn't get along well with the other interns at first, but she gradually becomes very close with them, helping her with her dating conquests. Harper is finally starting to find her place after always feeling like a misfit. 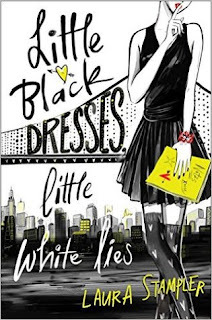 I really enjoyed all the characters of Little Black Dresses, Little White Lies - there were so many different personalities in play, but something about all of them made sense for the city and their internships at Shift. Even their boss was amusing, always coming through with a Miranda-Priestly-esque critique. The entirety of Little Black Dresses, Little White Lies was a fun ride. There was never a dull moment, sticking with the fast pace of New York City. It reminded me a lot of the TV shows Jane by Design and The Carrie Diaries, which I absolutely loved. It was such an adorable coming of age story! If you're looking for a fun, quick read this summer, Little Black Dresses, Little White Lies is a great choice. I loved reading Harper's blog posts and going along with her on her crazy adventures. This book is full of great humor and sweet moments. I highly recommend this incredible debut, and I can't wait to read more from Laura Stampler! What are some books set in New York City that you love? Today, Bayram is here from Never Ending Books, and we decided to come up with a Pokémon Go book tag! We both love playing Pokémon Go, so it seemed like a fun idea for this post. If you enjoy this book tag, we tag YOU to complete it! Go catch 'em all! 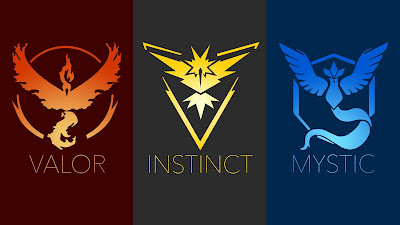 Kiersten: TEAM MYSTIC!!! (It's ok, we don't let our team differences get between us) - Hex Hall by Rachel Hawkins is such a fun book about a magical boarding school. Kiersten: I feel like I never buy books anymore (I'm trying to read books I already own and use the elibrary), but I did receive an ARC of We Know it Was You by Maggie Thrash at Blogbound Con last weekend! Kiersten: I'm normally not a huge fan of contemporary romance, but I was shocked by how much I absolutely loved Tell Me Three Things by Julie Buxbaum. Kiersten: And I Darken by Kiersten White is a book I really wanted to love but I just couldn't get into it. It's not that it was bad, it just didn't work out for me. Kiersten: I'm going to cheat a little and do this one as a series. 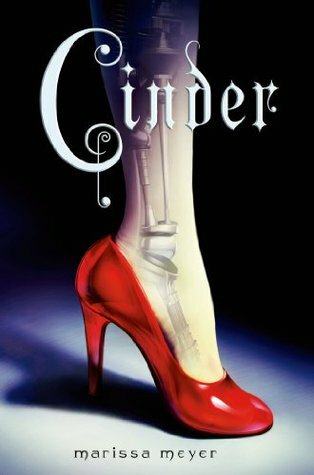 The concept for Cinder by Marissa Meyer put me off of reading it for a long time, but I ended up really loving the series! Kiersten: The Diviners by Libba Bray is definitely a slow paced book, but the way Libba Bray builds up all these layers in the story makes it so wonderful. Kiersten: The Accident Season by Moïra Fowley-Doyle is not only perfect for this category but is also one of my favorite books. 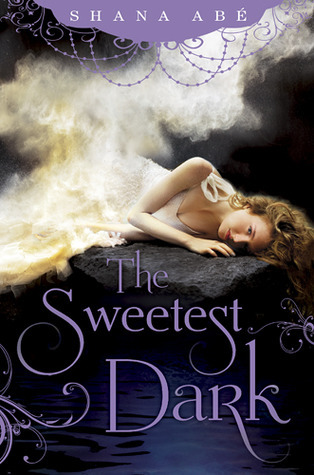 Kiersten: The Sweetest Dark by Shana Abé. Hands down. Kiersten: I feel like The Hunger Games are already starting to be taught in schools. I feel like it's definitely a staple of the YA genre and especially dystopian as a whole. Kiersten: Definitely A Court of Mist and Fury. All my feels, man. I also remember being a pathetic heap after Clockwork Princess by Cassandra Clare. Kiersten: I'm dying to get my hands on Empire of Storms by Sarah J. Maas! Also, these aren't upcoming releases because there is no news on when they will come out, but I would love the sequel to Courtney Eldridge's Ghost Time and the final book in The Sweetest Dark series by Shana Abé (please happen soon please). Kiersten: The Unfinished Life of Addison Stone by Adele Griffin is basically always my go to for things like this. It sounds like a strange book, but it's so good. I am a senior in high school who LOVES to read, especially YA and sci-fi genre books. I started my blog more than two years ago and regularly post reviews of books I have enjoyed and received to review. I have had a passion for reading ever since I was in kindergarten and have only strengthened it ever since. I love talking to the book community and discussing various books with them. 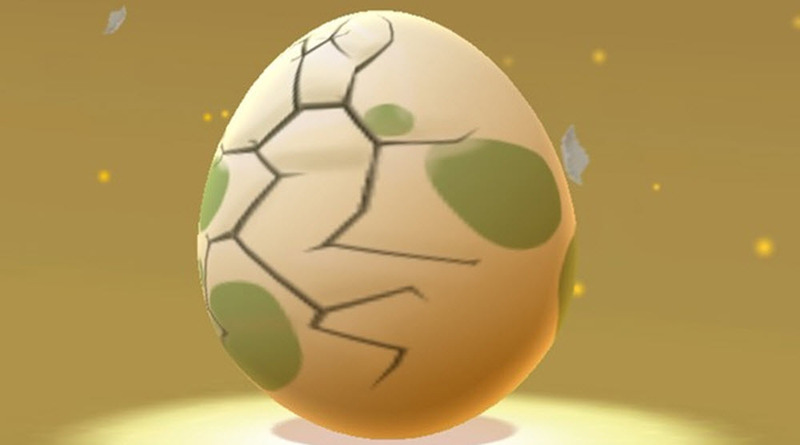 Do you play Pokémon Go? We'd love to hear your picks for this book tag!